Union Minister of State for Commerce and Industry Nirmala Sitharaman was in city recently to participate in the day-long programmes that included meeting BJP workers to see the progress of Vistarak campaign and interact with the trade bodies on GST. In spite of her busy schedule, the erudite, highly articulate, thinking-politician, who does not hesitate to call a spade a spade, Nirmala Sitharaman took time off to speak to Star of Mysore Features Editor N. Niranjan Nikam at the residence of BJP City President Dr. B. H. Manjunath, after partaking lunch. SOM: As a Minister of State, you report directly to the Prime Minister as you do not have a Cabinet Minister. What is the experience like to report to the PM directly? Nirmala Sitharaman: Absolutely challenging and interesting, specially when I have to report to a PM who has good knowledge of management, good knowledge of execution and also a person who involves himself from the planning till the final execution stage. You know he gets into the details. Therefore, you will have to be completely prepared when you meet him and report on the function or performance of your Ministry or a particular activity. He is like a CEO of a company looking at issues, looking at your performance and being ready to help. So, for me who has been in the corporate world before, to have a political leader and a Prime Minister giving this kind of a commitment, engagement and also guidance, is just an interesting element of my work. I enjoy it every bit. Star of Mysore (SOM): Karnataka is proud that a BJP MP from the State has become the Union Minister of Commerce and Industry. How much has the State benefited? Nirmala Sitharaman: I am not sure if the time has come yet to assess how much I have done or not done because it is only one full year since I took up the job. Meanwhile, I will give you broadly the picture of what are the kind of things I am doing. The first thing — because there was a demand from a lot of exporters of Horticulture perishable products from Belagavi area for a Director General of Foreign Trade (DGFT) office, I granted them permission. I got the land from the State Government for construction. Meanwhile, we have taken up an office for rent. That is the first thing I have done during my first visit. Then, I have adopted a village in Kolar district called Mallanayakanahalli, which is in Mulbagal, and there my team has started working on social mapping; on finding out what are the kind of things that could make their economic empowerment better, because it is a dry area, where there are lot of water-related problems. People there are used to growing during monsoon and other times some horticulture crops. Lot of mangoes is being grown there. Besides that, they are dependent on dairy so we are trying to see what best we can do. It is at an initial stage and our teams are already working on that. I have adopted a lake in Bengaluru in Kalena Agrahara, it is about 7.5 kms wide (as one newspaper called it, “Nirmala Sitharaman’s magic touch). I have already given my word for lake rejuvenation. The authorities have agreed that immediately after the monsoon, the lake will be drained out from all those inlets, which bring in untreated water. They will be connected to the common sewage treatment plant so that no untreated water will enter the lake, after rejuvenation happens. The people living around have all been co-opted into this project. Other than this, I have already sanctioned money and paid for a start-up co-share work space, as many of the start-ups are in such a stage where their core competency is to find solutions, innovation and so on as they usually do not have much resources even to set up the facility. The co-share workspace is the in-thing today; where a large space with plug-and-play facility is created. I have in Mangaluru, with the help of the local MP and the Mayor of the Corporation taken up a floor of one of the government buildings and I have allotted a budget of Rs. 1.18 crore for creating this facility. It will be managed by the start-ups with the Deputy Commissioner taking care of it and ensuring that the 60-seating capacity is used. I hear that already it is fully booked. Other than this, I want to give you the mind picture of how using three districts in coastal areas, Dakshina Kannada, Udupi and Karwar, we have created a triangle. The triangle consists of the schools at the bottom, colleges in the middle and two reputed institutions at the top. The bottom consists of 20 schools each from each of the three districts, it could be 20 or 15 but we are aiming at 20. We have already sent teams to train them, how to prepare, present and how to apply for Atal Innovation Mission (AIM) which is part of the Niti Aayog, where the school which gets qualified will get tinkering lab facility. They will be given equipment, plus cash up to Rs. 20 lakh each, within two or three years. With all the equipment coming to the schools it would become a centre of early stage of tinkering innovation at the bottom. They will have enhanced lab facilities, wherein science, agriculture, health, education and all kinds of app and non-app based work can be done. In that area in spite of having good monsoon, towns like Udupi getting potable water is a problem. The students can work on preservation of food, which is grown there. They will have to apply to AIM to get some funds to keep the innovation going. Now at the top is the innovation hub, which will be set up in NIT Suratkal and in NITTE. The teachers, students and non-teaching staff were sent to IIT Madras, where Dr. Jhunjhunwala, who actually set up the innovation hub here, took them around, took the initiative and shared the knowledge of what an industry-start-up collaboration is, and wanted to have similar if not better facility in NITTE and NIT Suratkal. That way we have created an entire pyramid from small, growing up to the university level. If we can have a Silicon Valley, why not a Start-Up Coast? asks Nirmala Sitharaman. That is why the media started calling it the Start-Up Coast. If we can have Silicon Valley, then why not a Start-up coast? This is the first in Karnataka for the entire country, and this is entirely my team’s work as Member of Parliament and not as Commerce Minister, as most of the things are outside of my Ministry. But the team has been very energetic. In Udupi we have just started the gems and jewellery training centre, where we get rural girls trained in manual and machine-made jewellery for which we have created four different capsules of initial training, marketing if you are a part of the shop how do you sell it. National Institute of Design will certify these courses. All the courses are for making and designing. They are also trained in Computer Aided Design (CAD) will have a duration of 90 hours, 120 hours or 200 hours. The classes will commence from October 1 and this will help local jewellers to get skilled workers who can be employed. SOM: You have been a very effective party spokesperson of BJP. With so many disruptive changes happening in the country, your Ministry is in the thick of things. Please comment. Nirmala Sitharaman: Yes, so many disruptive changes happening? That is what start-up is and I have given you the explanation (laughs). But, yes the Ministry is in charge of monitoring the import and exports related issues. I will tell you the example of arecanut, which is very much grown in Karnataka. Because of poor quality and spurious arecanut that comes into the country, Karnataka arecanut growers had problems, as their prices were going down. There was deep distress; we tried all methods to support them and failed. But I decided to stand by them and imposed higher duty on imported arecanut from arecanut growing countries, coming through non-arecanut growing countries like Nepal. Thus, we stopped the prices from falling, as a result of which areca growers are very happy..
SOM: It is very interesting to see that your husband Parakala Prabhakar’s family was a pro-Congress family. How have you both reconciled to this? Nirmala Sitharaman: (Raises her eyebrows, smiles!) Oh, we each do our own. The family has never been an obstruction to me; on the contrary, they have encouraged me in whatever I do, in the service of the nation, whether it is in the BJP or any other party. In fact, my mother-in-law has been strongly behind me. SOM: Your party has completed three years in office. Questions are being raised, as there is a lot of catching up to do. What is your view? Nirmala Sitharaman: Well, I think what this government has done in the last three years under the leadership of Prime Minister Narendra Modi is something, which is waited for over nearly 20 years. Because, some of the measures, which we initiated post 1991, happened during Atal Bihari Vajpayee’s time, but unfortunately, because that government could not come back to power, many things were left open. And, in the previous ten years we have noticed, that is before 2014, major steps in reformatory kind of way were being talked about but nothing happened, on the contrary there was only a policy paralysis. So, now after 2014, there is lot of things happening. Besides that in the first one or two years, the question was where are the big-ticket reforms? The big-ticket reforms cannot be bigger than the GST and demonetisation. Other than that, we have the insolvency Bill, bankruptcy code, also looking at various ways how Indian farmer can be protected by giving him insurance such that there are no small prints denying him the benefit, facilities to employees, PF reforms. I think these are major reforms. I think this government has really so much to do. It has been delivering in the last three years. Of course, we will keep carrying on. SOM: One nation, one tax is the buzzword today. GST is no doubt a game-changer. But, everyone feels there are too many taxes and it may not suit India at this juncture. How do you defend it? Nirmala Sitharaman: There are no too many taxes. If you take any one commodity then there are no too many taxes, but there are too many slabs, the 5, 12, 18 and 28 per cent. But for a country like India with clearly different sectors at different levels, with consumption ranging from poorest of the poor to very wealthy, you had to keep different slabs, the standard rates, or below it, or above it and not so standard rates. The normal picture, which everybody talks, has to be a bit more flexible. Hence, the ranges are different for different commodities. SOM: There is lot of concerns about people losing jobs and sacking in IT industry is sending wrong signals. Can the government step into control it? 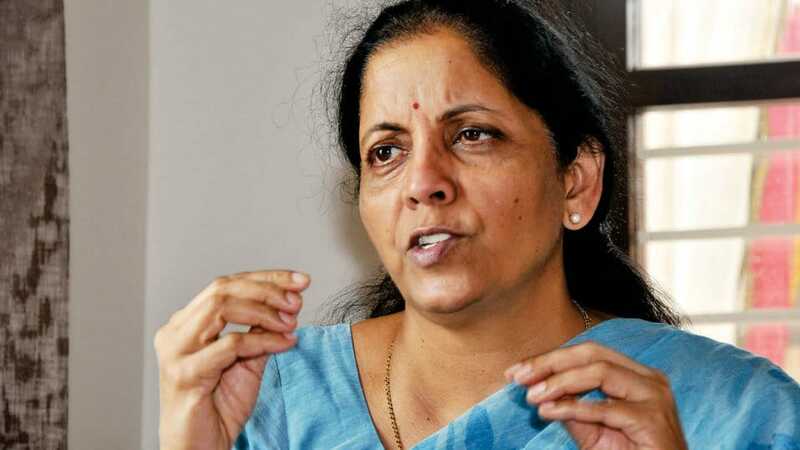 Nirmala Sitharaman: I thought ASSOCHAM (The Associated Chambers of Commerce of India) themselves have been very clearly saying that there is different relook at the business model that each of these companies have adopted. There is reshuffle happening in IT and one need not see this as throwing out labour, but it is more like readjusting their business model. Because, if you take the example of what is happening in the US they are looking at high-tech, highly qualified, specialised personnel coming over to US under H1B visa. Whereas, here in India, if the companies can deploy their hi-tech people abroad and also look at the domestic or non-domestic activity, this is the time to do it. 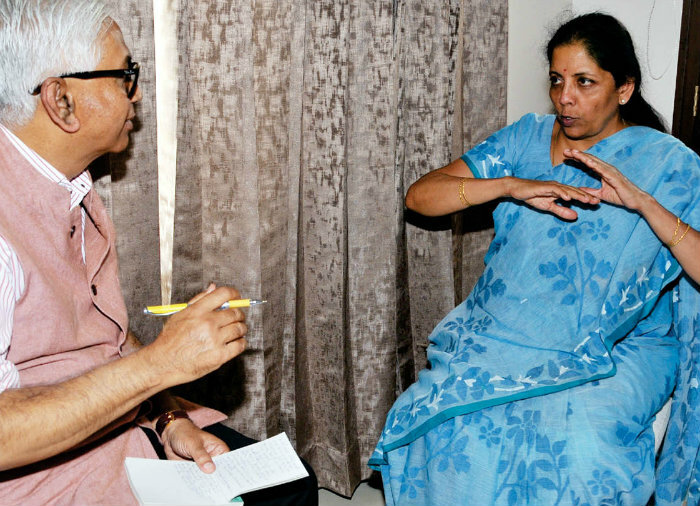 N. Niranjan Nikam in conversation with Nirmala Sitharaman. SOM: You worked for the BBC World Service. What was the experience like? 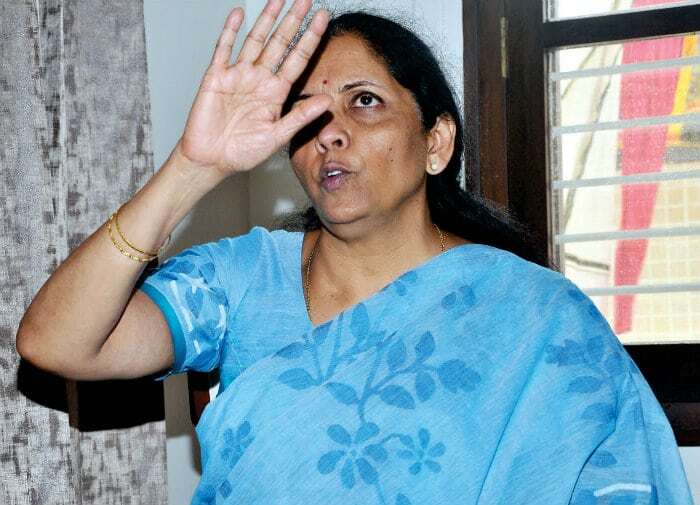 Nirmala Sitharaman: It was a part-time assignment in London and I worked for the Tamil service. It was very interesting. We had to work as a team with Tamils from Sri Lanka, South Africa and also from India. The stories that they would pick on, in which the copies were edited and presenting it in a nutshell was an excellent exercise to learn, because there was no chance for rambling and you had to be very precise and convey what you had to convey those stories, in the few minutes on air. So, the research you had to do had to be rigorous and at the same time concise. SOM: We are entering the 70th year of Independence. Where do you see our country down the line? Nirmala Sitharaman: I see it very bright and shining in the globe as one country, which is very energetic, seen a lot of hardship but also knows ways to come out of it. I see it leading the charge on education, technology and I see it also showing highly skilled mobile adaptable work force. There shall not be even one area where Indian fingers or brains are not involved in it. Irregularities in Vani Vilas Water Works: Leaking water pipes leak crores of rupees! Very well said. Thanks for sharing the detailed information of Nirmala Sitaramanji.